Ta strona używa plików cookie. Kontynuując przeglądanie tej strony bez zmian ustawień plików cookie swojej przeglądarki, wyrażasz zgodę na przechowywanie plików cookie. Aby uzyskać więcej informacji na temat plików cookies wykorzystywanych przez niniejszą stronę internetową przejdź do zakładki "Informacje o plikach cookie"
The new Mexican government could launch policies in order to increase domestic production and put emphasis on domestic agricultural support programmes. The Mexican food industry has performed well in 2018, with total sales expected to increase 8.7% year-on-year, to MXN 1,810 billion (EUR 78.7 billion). The Mexican food and agriculture sectors are highly export-driven, and most businesses showed stable profit margins in recent years as the United States kept zero duty for all Mexican imports in line with the NAFTA agreement. According to the draft of the renegotiated USMCA agreement, all current zero tariffs for food and agricultural products under the NAFTA will remain unchanged. However, the USMCA agreement is still subject to ratification in all three member states. Should this fail and trade disputes flare up again it could have a major impact on the industry, as Mexican food and agriculture exports to the US could be impacted by tariffs. At the same time Mexico imports most of its dairy from the US, and another deterioration of the US-Mexican trade relationsship could encourage Mexico to boost production at home. Mexico’s food sector could see some significant structural changes with the inauguration of President Andrés Manuel López Obrador. The new government could launch policies to increase domestic production and put emphasis on domestic agricultural support programmes. Currently Mexico still imports over 40% of the food it consumes, predominantly from the US, and runs a trade deficit in dairy, livestock, grains and oilseeds. Financing requirements and financial gearing are high in the food industry, and the willingness of banks to provide loans has encouraged further investments. The maximum payment period ranges from 30 to 120 days depending on the kind of products (perishable or non-perishable food products). Payment delays could increase in the coming months due to ongoing market uncertainty over the future of USMCA. However, at the same time the new administration's pledge to raise the minimum wage and boost living standards across the population augurs well for growth prospects in the food and drink industry. The insolvency level in the food industry is generally low, and no major increase is expected in 2019. Most of overdue payment is due to administrative reasons or commercial disputes, mainly covering small amounts. 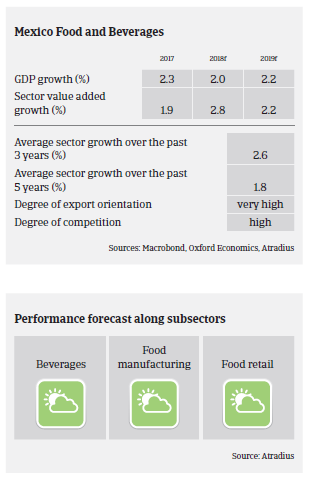 For the time being our underwriting stance for the food sector remains generally open for all main subsectors. The outlook for meat, dairy, beverages and food retail is positive, with steady sales growth expected in the short- and medium-term. For small buyers we try to obtain updated financial information and put emphasis on healthy financial ratios, low leverage profile and low risk concentration. We will carefully monitor the further USMCA process and adapt our underwriting stance if necessary. Sformułowania zawarte w niniejszym dokumencie mają wyłącznie ogólny charakter informacyjny i firma nie ponosi odpowiedzialności za ich wykorzystanie. Warunki regulujące znajdują się w aktualnej polisie ubezpieczeniowej albo we właściwej umowie dostarczenia produktów lub świadczenia usług. Żadnego z zawartych w tym dokumencie stwierdzeń nie należy interpretować jako powstania prawa, obowiązku, rekomendacji lub odpowiedzialności ze strony spółki Atradius, w tym obowiązku przeprowadzenia analizy due diligence nabywcy lub w Państwa imieniu. Jeśli spółka Atradius przeprowadza analizę due diligence dowolnego nabywcy, robi to wyłącznie do własnych celów związanych z działalnością ubezpieczeniową a nie na rzecz ubezpieczonego lub jakiegokolwiek innego podmiotu. Ponadto spółka Atradius ani jej podmioty powiązane, stowarzyszone lub zależne w żadnym wypadku nie ponosi odpowiedzialności za bezpośrednie, pośrednie, szczególne, przypadkowe lub wynikowe powstałe wskutek wykorzystania stwierdzeń zawartych w niniejszym dokumencie.